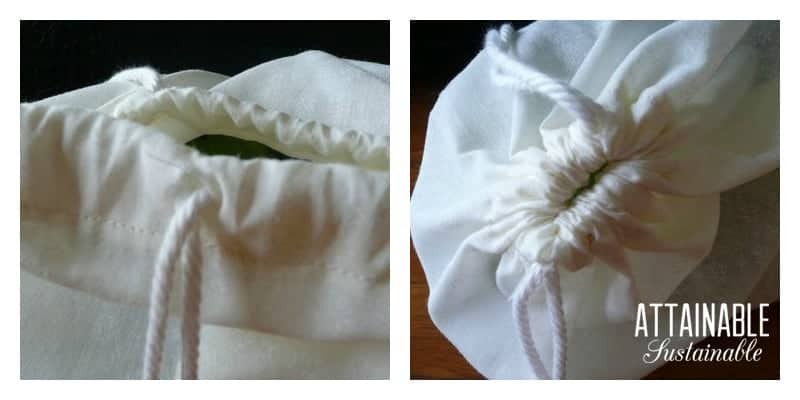 You won’t need those flimsy, single-use plastic produce bags from the supermarket when you learn how to make drawstring bags. This easy step-by-step will teach you how. You’re not still using those flimsy plastic produce bags at the grocery store are you? You are? Well, let’s just fix that right now, shall we? Follow the easy steps below to make your own reusable produce bags and reduce plastic waste at home. If you have a sewing machine and can sew a straight seam, you can make these. Of course, even if you don’t have a sewing machine, technically you could make these with a needle and thread, but that might be a little more effort than you’re willing to put out. Instead, find a friend with a sewing machine who will teach you to make drawstring bags in exchange for a nice cuppa or lunch. Start by cutting two pieces of fabric, about 12″ x 14″ and then take a peek at my instructions for sewing mini bags (there are plenty of photos). You’ll essentially use the same technique, making French seams for a cleaner finish. With wrong sides facing, sew a straight stitch along three edges using a 1/8″ seam allowance. I chose to leave the opening on the 12″ side of the bag, but you do what makes the most sense to you. Turn inside out and press seams. Now use a 3/8″ seam allowance to again sew all three sides. This seam — called a French seam — is essentially securing the loose ends inside of the seam. Turn your bag inside out and hem the opening by folding the fabric over twice (about a half-inch each time) and then sewing around the edge. Turn the bag right side out and admire it. Beautiful. Easy. How cool are you?? Use your scissors to carefully snip a 1/4″ cut in the outside of the top hem. (Pen in photo shows the snip.) Do this twice, on opposite sides of the bag. (It’ll be easier if you avoid making your snips near the seams.) Make sure you don’t accidentally cut through both layers. 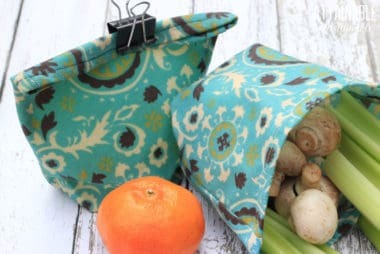 You won’t need those flimsy, single-use plastic produce bags from the supermarket when you make some of your own reusable produce bags. 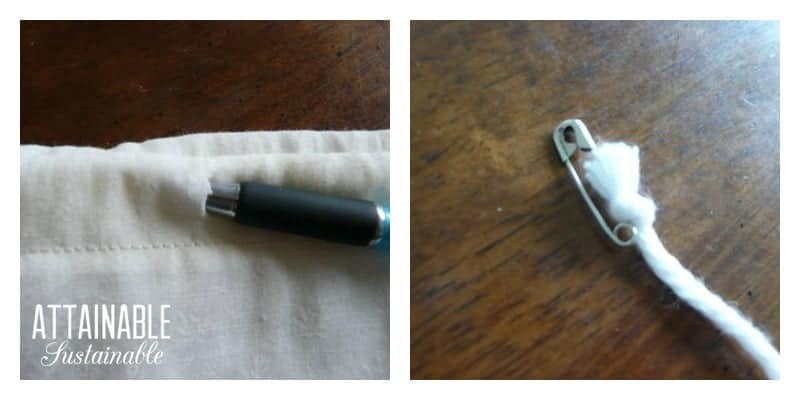 This is an easy sewing project for beginners, and a useful one, too, as you aim for a zero-waste kitchen. Cut two 24″ lengths of cording or ribbon. 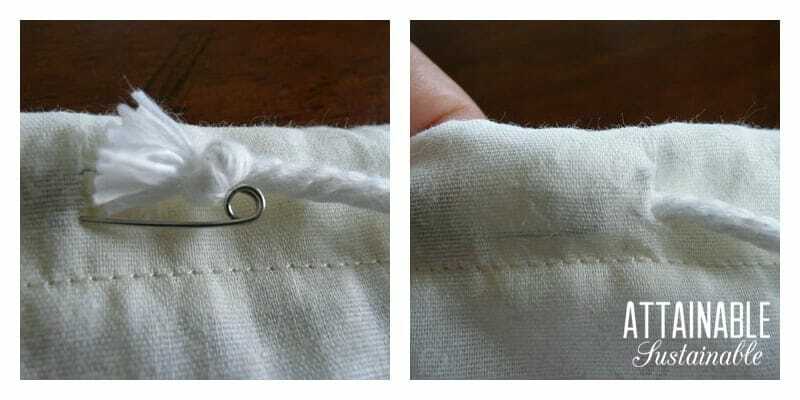 Pin a safety pin to one end of the cord and use it to pull the cord into one opening, all the way through the top hem, and out the same hole. Tie the ends together. Now do the same thing with the hole in the opposite side of the bag. When you pull both cords simultaneously, the top of the bag stays closed without the use of a twist tie, making it suitable for carrying produce or bulk items. 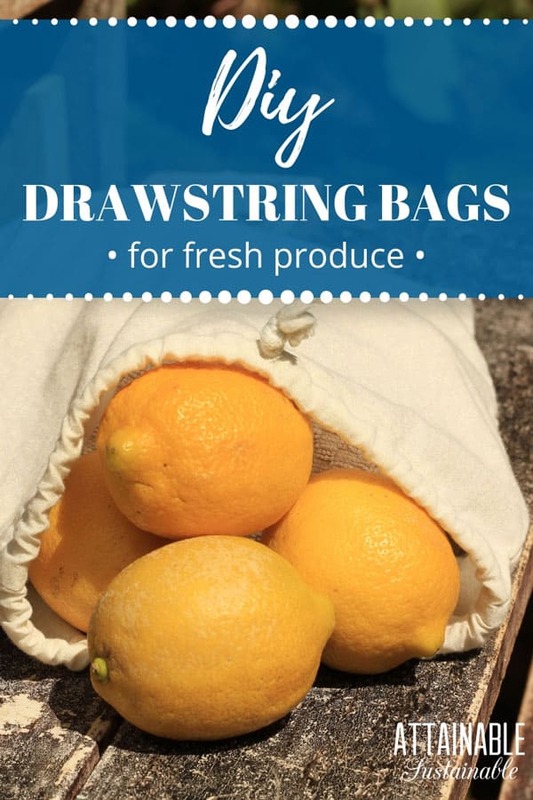 Now that you know how to make drawstring bags, you’re on your way to a collection of reusable produce bags to reduce your household waste! These instructions will work for virtually any type of fabric, so the possibilities are endless. Use remnants from your fabric box or keep your eyes open for possibilities at the local thrift store. I’ve made some from upcycled sheer curtains; sheets would also work. For the purpose of purchasing produce, you’ll want lightweight fabric so that you’re not charged a lot more for your fruits and veggies just because you opt for reusable produce bags. Now that you know how to make drawstring bags, you can get creative. Made with heavier fabric, these bags are also great as reusable gift bags to replace wrapping paper. Gift recipients can add the bags to their wrapping paper collection, and maybe they’ll decide to adopt this less wasteful way of wrapping, too! A set of these bags themselves would make a great gift, both for supermarket shoppers and kiddos. My kids always loved to have bags to sort things into. Choose some fun fabric and go wild. 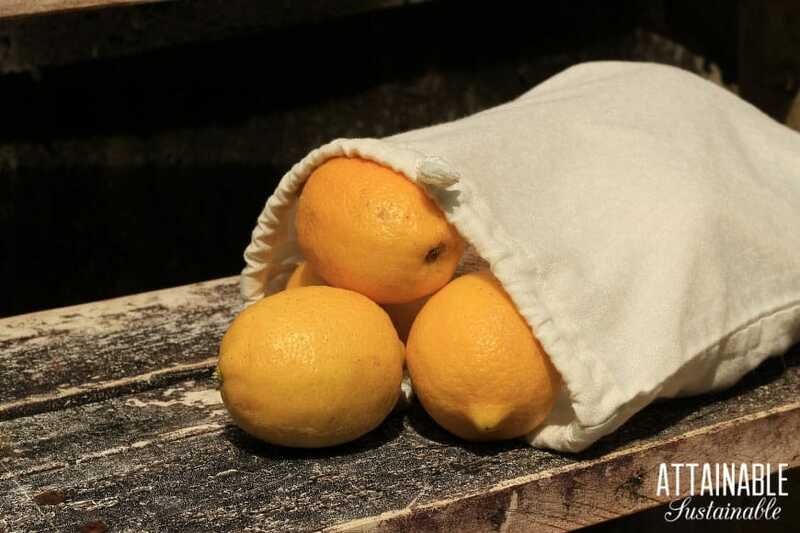 Related: Make linen bread bags in just 15 minutes – no more moldy bread! Yes, I use those plastic produce bags — for what it’s worth, though, I (a) reuse the same plastic bags over and over again and (b) don’t even bag when I have 3 or less or a particular item. It’s a pain in the rear for the cashier, but it keeps my bagging to a minimum. If you make them from organza they will be virtually weightless. Yes! I have some made from an old airy “sheer” curtain, too. I was just wondering today if I could buy these. This is even better. Love it . Thank you. 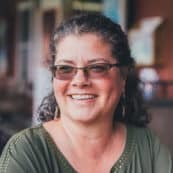 Check out etsy.com. Pretty sure some folks sell them on that site!! I’ve been trying to knit some mesh bags to use for a couple of months (trial and – mostly – error). My hubby keeps telling to sew some, and he is probably right, but I’m set on my method for a while longer. Roxanne – I bought some of those knit bags and it left marks in the more tender fruits & vegetables. The tomatoes looked like they’d been sitting on railroad tracks, and the marks cut into the flesh in some places. Thanks, Carley, for the heads-up. If I can ever get a bag to turn out right, I’ll be careful with more delicate items. Fantastic post. I love cloth bags and use them all the time now I’ll be able to make my own. Thanks. Have you encountered the checkers giving you a hard time at all when you use these bags. I’ve found even with my reusable grocery bags some checkers are better about taking them than others. It seems most people don’t realize you mean these bags to be used as keepers of the produce in the fridge…. To everyone above who thinks these are for you to take to the store and put your produce in them before taking to the cashier… the weight of the fabric and the cord will make a difference at checkout in the price per pound or ounce….so these are for when you get the produce home and get ready to store them in the refrigerator. 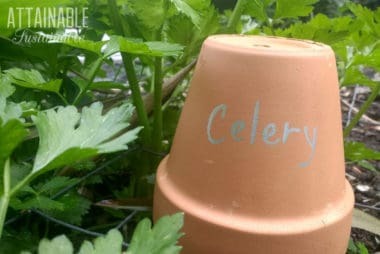 Your produce will last longer and not get slimy as easily. Actually, Sonia, that’s not true. I DO mean for people to use them to purchase veggies/fruits at the store. The weight of the fabric might make a small difference at the checkout, but it’s a price I’m willing to pay to avoid those plastic bags. Note that SOME stores will pre-weigh your bags and mark them with a tare weight so that you pay only for the produce, not the bag. I just have them tare the weights before filling them with produce. I do the same thing with my mason jars for bulk items. They just give me a little sticker on it with the tare weight so they can adjust the price at checkout. And once I have the weight for a container I can just mark it with permanent marker so it doesn’t have to be weighed at the next trip. Easy peasy! Where are you shopping that they will do this… and do you go to the cash first and then do your shopping or do you empty the bag have then have them tare then fill it back up? Right? you don’t need those plastic bags. Most times my veggies go in the shopping cart without bags. Or from the farmers market. I sometimes put my tomatoes in my coat pocket to keep them from getting bruised. I have these great produce shopping bag like the bags people crochet, that is what I put my produce in from the market or store. I’m not a sewer, but you make this look pretty easy! I don’t know if produce is sold differently where you shop but where I shop it is mostly sold by weight, that is to say the cashier put it on a scale that is already set up to subtract the weight of the bag. 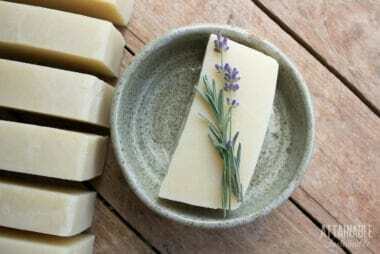 If you use a material that weighs more than the plastic bag you will pay for that as well. Any solutions out there? Anyone found a material that weighs as little as the plastic bag? I like the “sheer” fabric that curtains are often made of. Yep, that would cut out a step!